This stamp is called Mimo Slingshot. 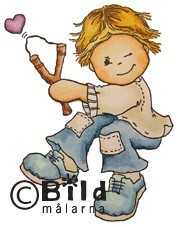 Mimo is the sweet little boy in the Bildmalarna line. This measures approx. 3" tall x 2 1/4" wide.